But do you not eat any of the above because it’s so unhealthy and fattening? Here’s how to enjoy all of the above with one simple change. Ok before you gag and say “I” can’t even use Ground Turkey instead of ground beef let alone get my famiily to, let me show you how!! NO ONE WILL EVER KNOW, I Promise! Does this look like Turkey? This is 99% Fat Free Ground Turkey – all dressed up so no one will know. I use this in all my recipes above. 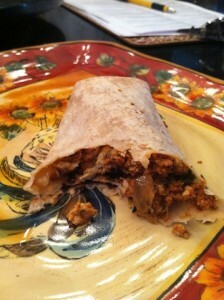 And this is also my disguised chorizo!! I married a Hispanic man who was raised on Tortillas and refried beans and one of his favorite meals is a good unhealthy chorizo and egg burrito. 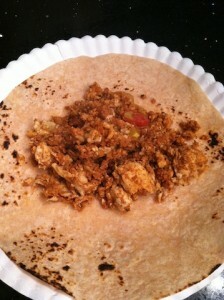 When I made this turkey one night I was going to make a turkey veggie omelet but I poured the eggs in and forgot to treat it like an omelet so I scrambled them and added the turkey meat, slapped it in a burrito and my husband and kids thought I had lost my mind and prepared a traditional chorizo and Egg Burrito. I used salsa and fat free plain greek yogurt and they were completely fooled. It is now requested on a regular basis. When the brown/red juice was spilling onto my husbands plate he said almost disgusted… “are you sure this isn’t grease”??? I said no – it’s water!! But keep reading…don’t stop here. 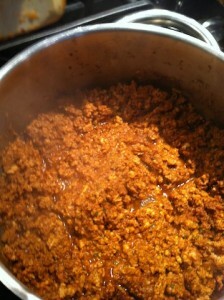 About a year ago I begrudgingly switched to ground turkey instead of ground beef. I gagged my first few bites of every meal trying to get used to the stuff that looked like white mushed up cotton balls in my chili and thought there has to be a better way!! So I set out to perfect it and this is what I came up with. In order to get your meat to be small, ground looking, crushed (like taco bell’s meat) you start out with water. 1) put about 1 to 1 1/2 Cups water in your pot. 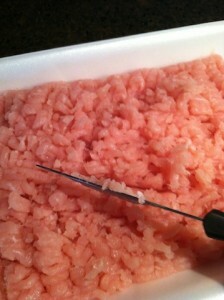 The thing that grossed me out about ground turkey was it looking like rabbit pellets (or Fiber cereal) in my food. 3) Now as you take the turkey out, take about 1/2 cup at a time and smoosh between your fingers (you can wear food grade rubber gloves if this grosses you out – but if your hands are wet the meat really won’t stick too much) and put it into the water in the pan. You’ll need something to grind the meat with – I personally use a potato masher or I found this nifty little masher that I like a lot. 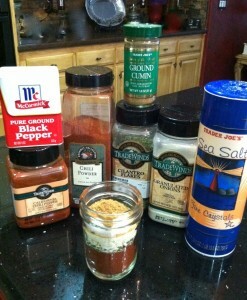 **tip** I use Jelly Jars and make up 2 or 3 jars at a time so I have them ready the next time I want to make turkey meat. 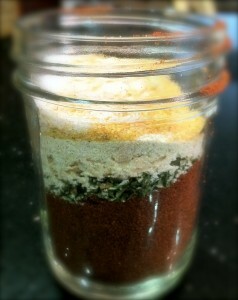 5) if it’s too dry and not mashing well add a little more water. 6) MASH, MASH, MASH, stir, stir, stir! 7. Cover with a tight lid and simmer on low for about 15 mins and it will be so tender and juicy and full of flavor when you’re finished. Stir and Mash more if you can or depending on the consistency you want. Now you have Versatile Turkey that you can use for just about any recipe that calls for this type of seasoned meat. Are you telling me we have been eating turkey all this time? OMG this looks amazing! I am totally going to try it. My hubby is Jamaican and loves all things spicy. I turned him onto mexican food (bakersfield style, yum!) when we met but now he has high cholesterol and I have 20#s to go. Love all your advice Tammy, keep it up. Thank you! I am at a friends and she told me about your website. Where did you find that masher? 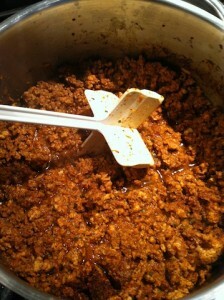 I already use turkey “hamburger” and your right you get used to it and even prefer it…..however, I like the idea of mashing it to make it look more like ground beef.